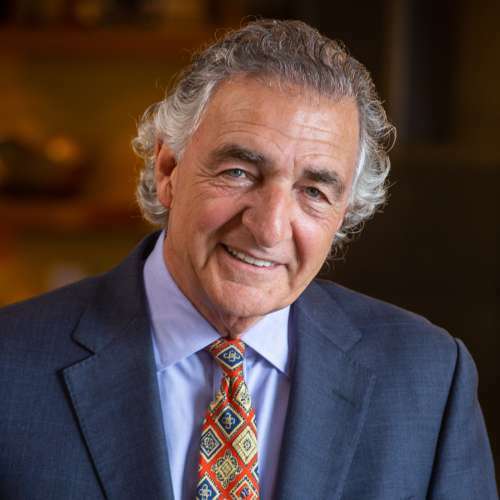 Tom Bozzuto is Chairman and Co-Founder of The Bozzuto Group, a diversified and full-service real estate company that recently celebrated its 30th year in business. An entrepreneur, philanthropist and veteran of the Vietnam War, Tom is a longtime supporter and champion of the Baltimore community, is actively involved in national housing policy and is very dedicated to higher education. He is a graduate of Hobart College and has a master’s degree in Metropolitan Studies from The Maxwell School at Syracuse University. During his more than 45-year career in real estate, Tom and his partners have overseen the development and construction of more than 50,000 residences. Together they created a company that annually starts more than 1,000 homes and apartments and that currently manages 70,000 apartments. Under his leadership, The Bozzuto Group has earned recognition from the National Association of Home Builders as Builder of the Year, Multifamily Development Firm of the Year and, three times, Property Management Company of the Year. Among many other awards, the firm has been repeatedly recognized for its company culture as a Best Place to Work, including seven times by the Washington Business Journal, three by the Washington Post and nationally as a top ten company by Multifamily Executive Magazine. Further, as a testament to Bozzuto’s commitment to diversity and inclusion, The National Association of Female Executives recently selected the firm as a Top Company for Executive Women. In addition to his business activities, Tom has had a long career of community involvement and leadership. He served as President of Baltimore Citizens’ Planning and Housing Association, Chair of the Maryland Science Center, Chairman of the National Multi-Housing Council and Vice President of the Walters Art Gallery. He is currently serving as Chairman of the Board of Trustees at Hobart & William Smith Colleges. In addition, he is a member of the Advisory Board of the Harvard Joint Center for Housing Policy, a Board Member of Greater Baltimore Committee and a member of the Board and Executive Committee at the Baltimore Community Foundation. A Senatorial Appointee to the Millennial Housing Commission, and several times a member of the Governor’s Housing Commission, Bozzuto has earned numerous awards and recognition for his professional achievements, including the Urban Land Institute’s Lifetime Achievement Award. As part of the first generation of his family to attend college, he and his wife, Barbara, established the Thomas S. Bozzuto ’68 Endowed Scholarship Fund, the Bozzuto Family First-Generation Endowed Scholarship, and the Bozzuto Center for Entrepreneurship at Hobart and William Smith. He was recently awarded an Honorary Degree in Humane Letters by the Colleges. In addition, The Bozzuto Group’s founder and chairman shares personal reflections and words of wisdom in his recently published book, Reflections of an Ordinary Man. You can preview and purchase the book on Amazon by clicking here.